Mechanical Advantage is the calculation of how much faster and easier a machine makes your work. It compares the output force a mechanism or machine gives you to the input force that is applied to that mechanism or machine to get it to work. Mechanical advantage can be adjusted to meet specific needs. For example, bicycle gears can be set one way to ride uphill, then adjusted to ride downhill. The rider has limited power, but by adjusting the mechanical advantage to appropriate speed and torque outputs, the output from the rider’s power can be maximized in varying conditions. With VEX IQ, changing gear ratios is also a great way to adjust mechanical advantage. 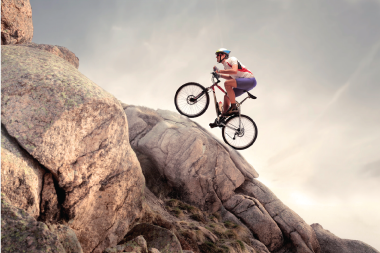 A bike’s high-speed gear ratio can maximize its efficiency on a downhill or flat slope. 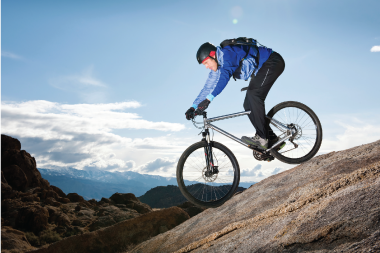 A high-torque gear ratio can help a bike to climb up hills easily using mechanical advantage.